Olga is a typical Russian girl – young, beautiful, smart and successful. She works in one of the leading Moscow Digital Agencies. Most of her workdays are filled with pitch writing, presentations and meetings with clients. In her spare time she loves fitness and studies to become a director of creative video. 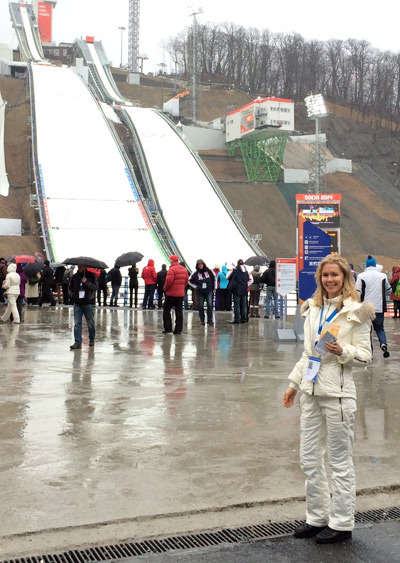 This week Olga is in Sochi and we are lucky to have her insider’s opinion on the ambiance of Sochi Olympics 2014! Olga, when did you decide to travel to Sochi? Did you plan that trip in advance? 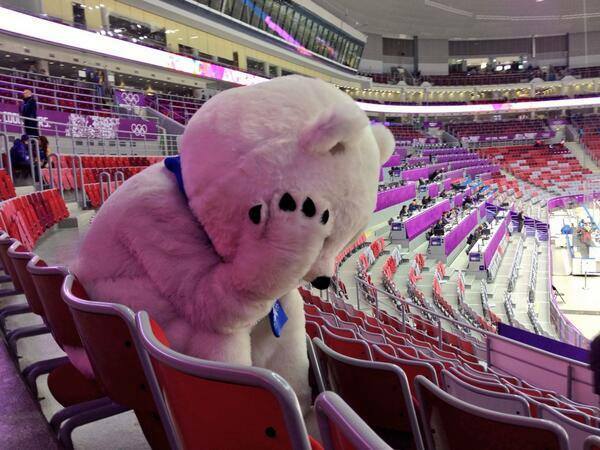 I wanted to travel to Sochi for Olympics since I’ve heard about the Games. But all my friends kept telling me that it is impossible to find airfare, accommodation and tickets to sport events, so I did not even try to arrange that trip. However, after I watched the Opening Ceremony, I was so emotionally moved! I decided, “it’s better late than never” and started to plan the trip. How complicated was that? We all heard a lot of stories about obstacles with getting fan’s pass and booking a tour. Did you employ a tour agency to bring you to Sochi? No, I planned everything on my own. 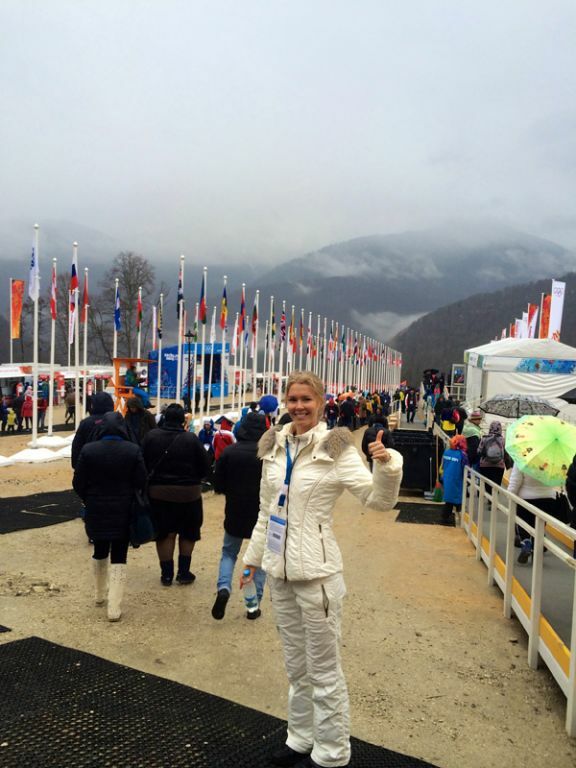 I went to the official Olympics web site www.sochi2014.com, read the rules, applied for the fan’s pass, got it approved, bought the tickets to sport events and started to look for a hotel and airfare. 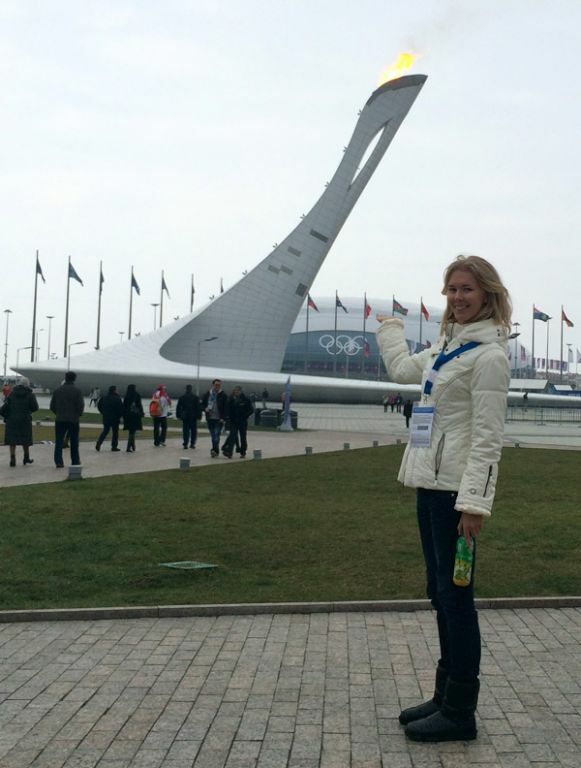 It took me less than a week from the time I decided to travel to Sochi until I was there. Wow! That was one good planning! Can you say that there were absolutely no obstacles on your way to Sochi? Being a last minute planner, I expected a lot of obstacles and I had some indeed. But all in all – it went quite smooth. The only major nuisance was that Visa has occupied the Games and it is impossible to buy any tickets to sport events, using the Mastercard. One has to pay with Visa and even bring the physical card to the ticket office when receiving the tickets. I did not have a Visa card and had to cooperate with friends on that. Another minor nuisance was that one can pay online, but still has to stay in line to a ticket office for several hours to get the tickets. That does not really make any sense and I am glad I went through that in Moscow (3 hour wait) rather than in Sochi (5+ hour wait). People waiting in line were rather uplifted though – strange to say, but I had a good time even there. 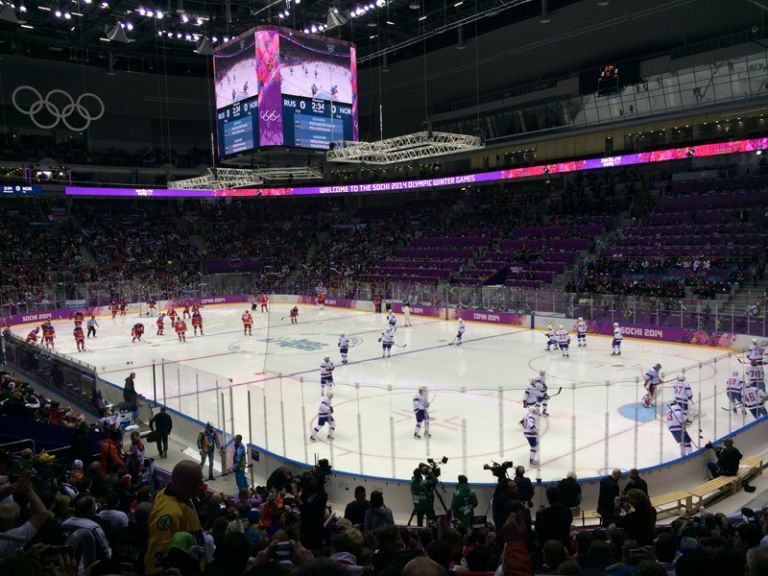 There were no problems to find tickets to Sochi – plenty of direct flights from Moscow every day. Finding a hotel was more difficult, but again – one should not procrastinate until the last minute. I used Booking.com, but made several changes in the course of the week. First hotel was too far, second one I did not like much, and the final choice was perfect! It was a small and no-star hotel, but it was very clean and I had a view of the Olympic Flame from my room. Certainly have not seen any weird things in the hotel during my stay. 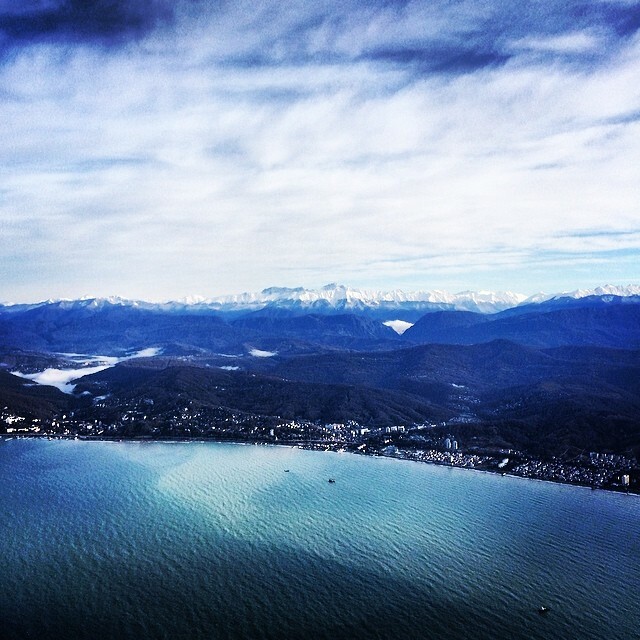 How good is the transport infrastructure in Sochi? Did you experience any trouble getting to the Olympic venues? Not at all! I was stunned to see how well transport is organized there! Official Sochi Olympics site makes it easy to plan all your movements. There are trains, buses, cable cars (funiculars) and for all that there is a strict timetable available on the web site and a tool that allows you to calculate the exact duration of any ride. In addition to that – I had a standee just outside my hotel with all that information. I would give an A+ for how transportation is arranged in Sochi! Were you able to get tickets to the events you wanted to see? What’s your favorite winter sport by the way? I never engaged in winter sports myself. Of course, being Russian, I first of all looked for tickets to hockey, figure skating and other sports in which our team is strong. But in general – I just wanted to experience the Olympics atmosphere, so all sports were interesting to me. I bought tickets to sport events at the Coastal Cluster for the first day and tickets to events at the Mountain Cluster for the second day. 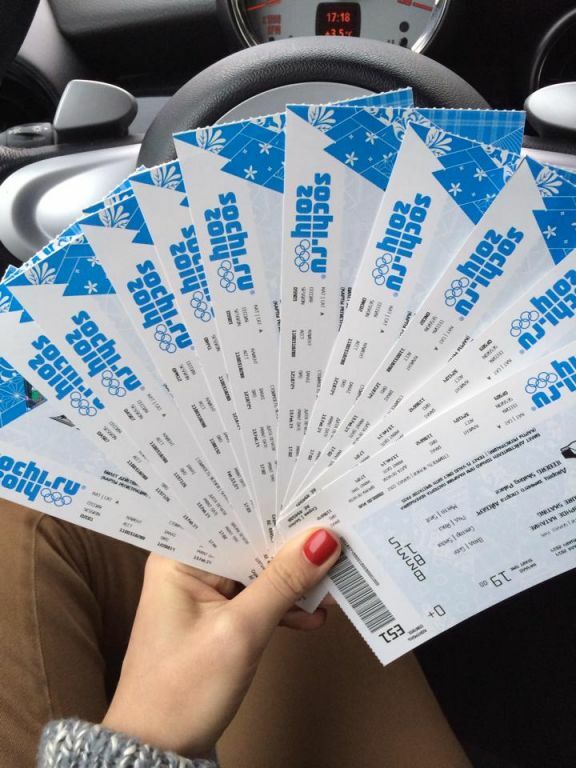 I bought some of the tickets to sport events directly from the web site and some on the Fan2Fan page on the site. Buying tickets though a fan page was slightly more expensive. How expensive are the tickets? How expensive was the trip in general? Since I was buying the tickets last minute – the cheapest tickets were already gone. Tickets to mountain sports cost about $200 each, tickets to hockey were about $350 each, tickets to figure skating were about $700 each. The most expensive were tickets to the Closing Ceremony – more than a $1000 each. Comparing to that expenses, travel and accommodation were quite affordable. But being here is priceless, so it is totally worth it. 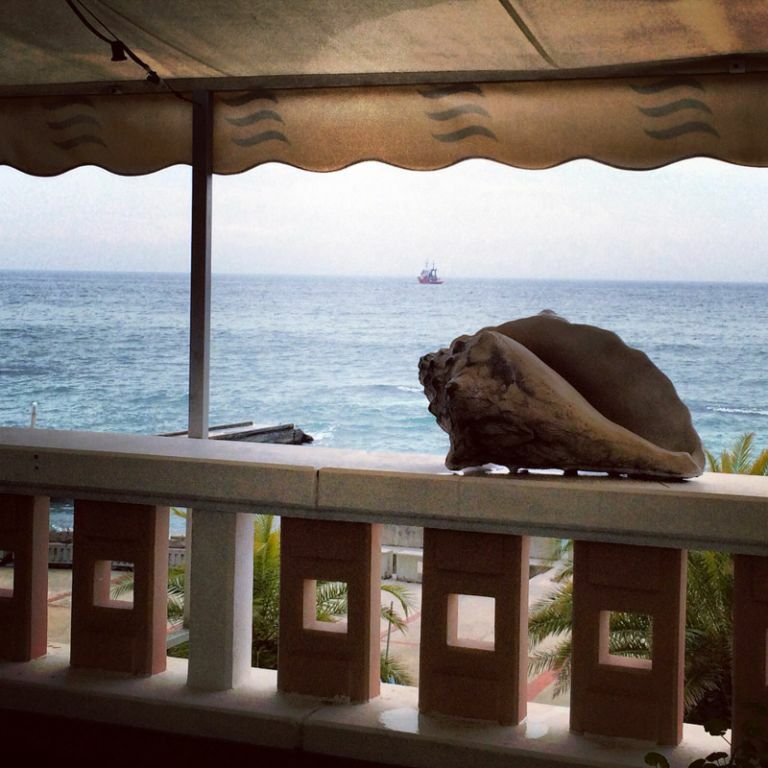 Have you been to Sochi before? Did you like the city? Did you have a chance to talk with locals? I haven’t been to Sochi before. I really liked the city! Now, during the Games everything is very festive. We had a chance to talk to locals and they seemed very excited about the Olympics. I was especially stunned to see the unique nature of that region. 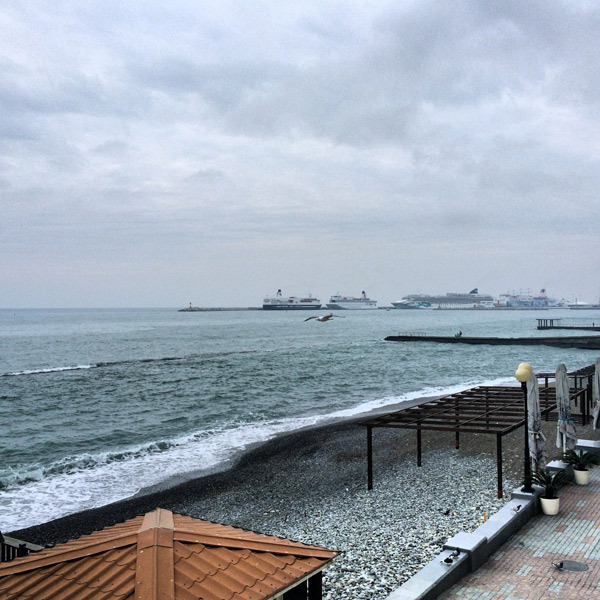 Both the sea and the mountains are so close to Sochi. I definitely want to travel there after the Olympics. Maybe I will even start skiing myself. 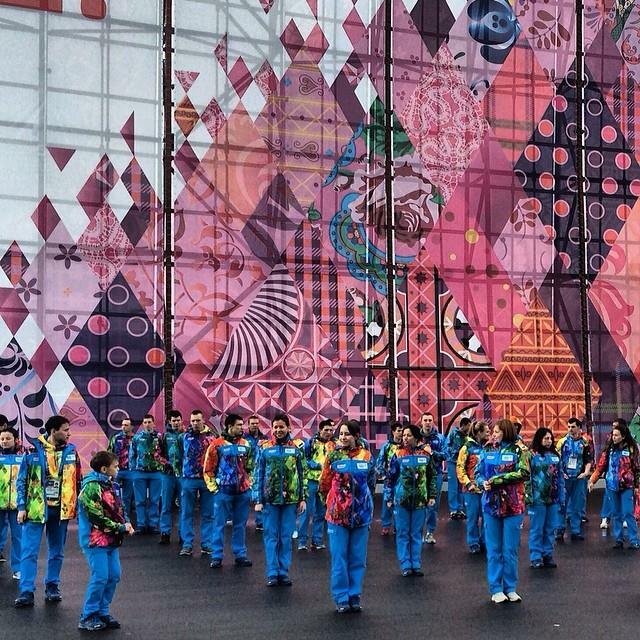 What was your impression of the Olympic Park? Gorgeous! Lots of stadiums and many pavilions of sponsors with cool entertainment inside. One thing that I did not like – because of the long lines it was impossible to buy souvenirs or actually visit the sponsors pavilions. We ended up buying some souvenirs when we went to the city, but I am not sure whether these souvenirs were officially licensed ones. What about the food at the Olympic venues? Food was a disaster. I expected that there should be plenty of places to eat, but in the Olympic Park there is just the main canteen, which is overcrowded and the food is sub-par. There is also one very good restaurant there, but it was impossible to get in without staying in the huge line. And in the mountains food options included only bbq (“shashlyk”) and sandwiches. I was surprised that although McDonalds is a sponsor of the Games, I have not seen McDonalds there. Is it true that alcohol is not served at the Olympic venues? I did not pay much attention to that. I think that beer was available, Russian brand Baltica is a sponsor of the Games. Selection of non-alcohol beverages included only drinks by Coca Cola, since they are sponsoring the Games. How was the atmosphere at the sport events? Were there many fans from other countries? How friendly were Russian fans towards foreigners? It is an atmosphere of excitement, sport and unity. Especially at the figure skating and hockey. On the way to the stadium, you see thousands of fans, cheering for their teams. I clapped hands so much, that my palms ache now. The majority of fans are Russian, but I have also met Canadians, Americans, French and others. Atmosphere is very friendly and fans applaud not only sportsmen from their teams, but also to the achievements of sportsmen from other teams and at the award ceremony. We have all seen the Canadian trainer helping Russian skier and giving him the ski. Olympic Games are a competition, but in the same time there is a lot of support and a true atmosphere of the Olympic Family. How is the security at the Sochi Olympics venues? Excellent! I feel very secure here. There is a lot of police everywhere, both in the city and at the Olympic venues. To get to the Olympic Park one has to go through a very serious security check, but once you are inside – you can move freely. Did you find volunteers helpful? Were there many of them? Did you notice them speaking English to foreign visitors? Volunteers are awesome and there are hundreds if not thousands of them. You can spot volunteers easily – they have a very cool bright colored uniform. Volunteers are very helpful, knowledgeable and cheerful. I have seen volunteers speaking decent English to foreigners. I also noticed that fans always try to help other fans when they see that a person is lost or needs any information. And people are very open and engage in conversations on the buses, in trains and on tribunes. What was the weather like during this week? I knew that I have to expect any kind of weather. It was very warm and sunny at the start of the Games, than it got colder. What I did not expect was the rain in the mountains. Tribunes do not have the cover, so we were watching downhill skiing in the rain. We were concerned about the skiers, but the commentators said that rain is not dangerous for them. I also witnessed the thick fog. Some sport events were postponed because of the fog, which was as dense as milk. 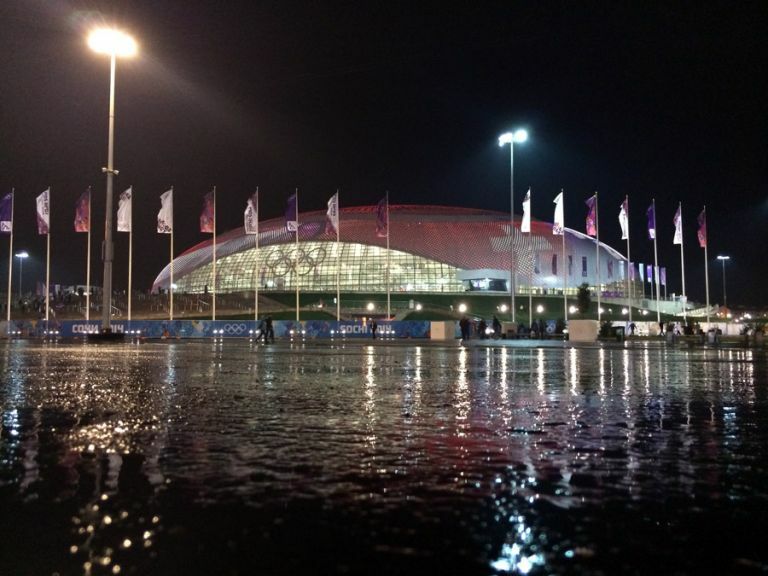 Will Sochi become a popular winter sports resort after the Games? Do you plan to travel there again? 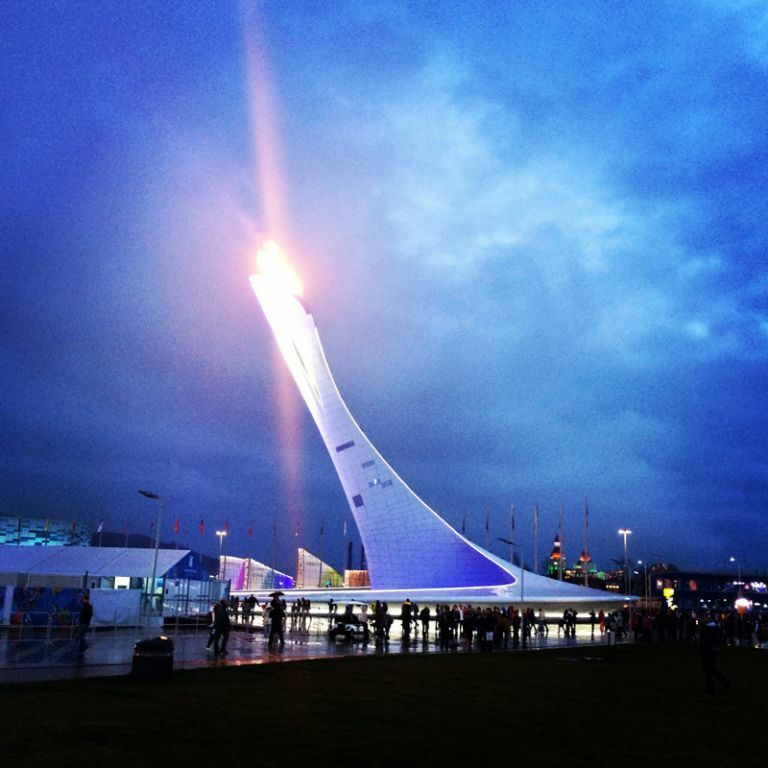 I definitely want to travel to Sochi after the Olympics. Maybe I will even start skiing myself. But the Games are not finished yet, so I look forward seeing more sport events. And of course, I anticipate seeing the Closing Ceremony. 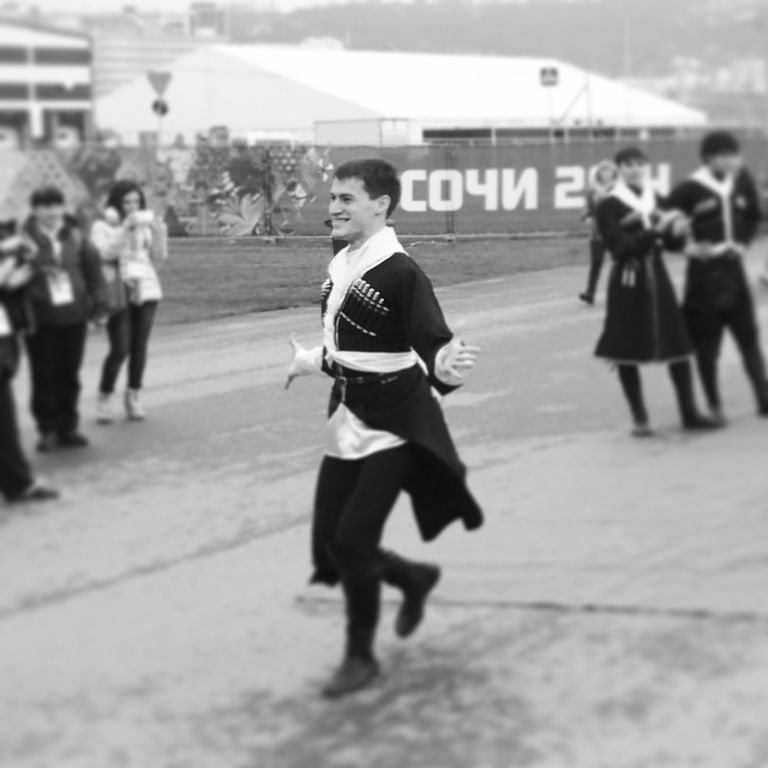 By the way, after I went to Sochi, many of my friends, colleagues and even my boss decided to go there now as well. I read the story from A to Z – it is very interesting!!! Wonderful! I hope to hear more from Olga – after she watches the Closing ceremony! And I am also preparing a very cool surprise for all my readers – make sure you visit the blog or Facebook page on Monday!